Hi I'm Stephanie! I'm a personal trainer who helps runners reach new goals and distances. I am passionate about helping runners reach their goals. I believe in meeting people where there are and building them up not tearing them down. I provide one on one support, individualized training plans with all your running and strength workouts. I'm a big believer in strength training for runners. Strength training will make you a stronger faster more efficient runner. I look forward to talking to you. Hi I'm Stephanie. I remember back in 2009 I woke up and decided I wanted to be a runner. I wanted to run but I had no clue where to start. What shoes did I need? What was I going to wear? Did I did to bring water? I nervously signed up for a Learn to Run Program. I remember showing up to my first session, my heart was racing, my palms were sweating and I had no clue what to expect. The reassuring words and support from my coach helped get me out the door and run. 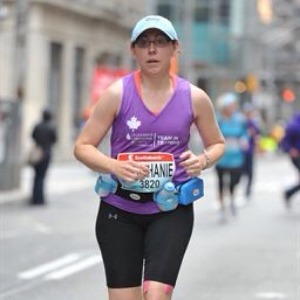 The 12 week Learn to Run Program turned me from overwhelmed nervous non runner to a runner. My graduation was a 5km run, I crossed that finish line threw my hands in the air, I had done it. I was a runner. I had the runner's high, I had to keep going. As I continued running I felt called to become a personal trainer. I felt called to help people go from overwhelm to become runners. To help people to run further, and cross the finish line with their arms in the air feeling accomplished. I would love to help you on your running journey. As a personal trainer I'm a strong believer that strength training as part of your training program. I provide one on one individual training plans which include your cardio and strength training workouts. I work with runners virtually and provide individualized strength training and running workouts. I also provide support along the way. I'd love to chat about how I can help you with your running and strength training! Success. Coach Stephanie Xamin has been notified of your message.